A few years ago when there were several flu strains going around, I remember reading that immunologists were saying that there was no way to protect yourself with vitamins. The particular article read, 'Throw out all your vitamins and stock up on green tea." You know what? Green tea offers great immune support for dogs too! I Love Dogs Green Tea Antioxidant Boost is, in my mind, the top of the line green tea for dogs. It contains 500 milligrams of green tea extract, the most effective form of antioxidant you can find in a green tea supplement. And 500 milligrams is a solid dose of protection, not a watered down version of what humans should take. Liver-flavored, so hopefully your dog will eagerly woof down his daily tablet, the Green Tea Antioxidant Boost will offer your dog protection against free radical damage to cells, against cancer, against tooth decay, against arthritis, and it even helps prevent weight gain. 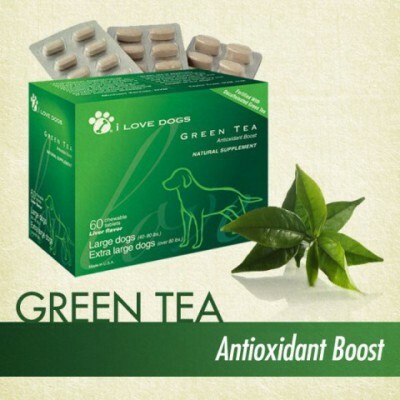 I Love Dogs Green Tea Antioxidant Boost is a super green gift for you and your dog. Available in a 60 day supply from Amazon.com. The Best Christmas Gift for a Dog-- EVER. The Bonus Animal Video of the Day!! !